Let’s trying to give an amazing filter effects in our photo with 1900 Camera – Retro Camera – Vintage Camera Filter application. want to make your images more attractive,creative and gorgeous with amazing filter effects then sure you will try this 1900 Camera – Retro Camera – Vintage Camera Filter application with latest features. 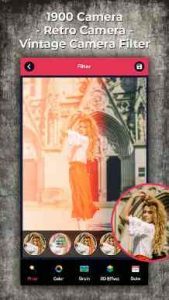 1900 Camera – Retro Camera – Vintage Camera Filter is best and powerful tool which make your photo more creative ad beautiful. this photo editor app allows you to edit picture easily, and even turn your photo into amazing filter effects.this app which provide all the latest photo editing facility in one application. 1900 Camera – Retro Camera – Vintage Camera Filter is new application which contain latest different effects like net effect,3D frame,blend,coloreffect,pixel etc..
Open your image with help of camera and gallery. You have option to apply all filter effects in your photo. It’s provide different effects like net effects,3d frame,blend,color and also pixel effects. You can save your images in my creation. Share your image via social networking like facebook,instagarm,twitter etc.. Easily make your photo with photo editing tools. Provide 3d,pixel,net and blur effects. save and share with friends via social media.